1. Prices stated do not include postage and handling charges. Pending on the weight of the item(s) and destination, the postage charge(s) apply. We will appoint the most cost-effective courier company for this delivery. 2. We will email to confirm the item(s) availability, postage charges and provide an e-invoice. Please reply to our email to have the item(s) reserved for you. Please make your payment within 48 hours, after which the item(s) will be put up for sale again. 1. Debit card / Credit card via Paypal. An additional charge of 3.4% + SGD$0.50 applies for transaction fee. We will email you a Paypal request-for-money to facilitate this purchase. To learn more about Paypal, click here. For registered article, we will email you the Registered Article (RA) Tracking Number (e.g. RR123456789SG) when your package/s have been mailed out. All registered package(s) are delivered to your doorstep at the mailing address indicated in your email. Delivery may take up to 2 weeks or more. 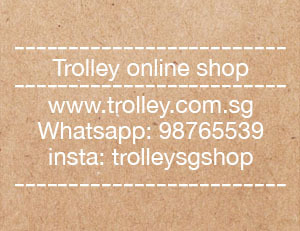 Trolley shall not be responsible for lost/ damaged mailed-out items if you had chosen not to opt for registered mail. For damaged/loss of goods, the claims shall be made with the courier/delivery company as advised by Trolley. Once an order has been placed and payment made, it can no longer be cancelled and no refunds can be made. Your order will be mailed as scheduled. For extraordinary cases, an order may be cancelled. However, a 20% processing fee will be charged.